Tetrahydroisoquinoline-4-carboxylic acid, a constrained beta-2-amino acid named beta-TIC, wassy in the sised for the first time in enantiopure form .The biocatalytic route applied herein represents one of the few successful examples of enzymatic resolu tion of beta-2-aminoacids. Model tetrapeptides, namely, Fmoc-l-Ala-b-TIC-b-Ala-l-Val-OBn (Fmoc = fluorenyl-methyloxycarbonyl, Bn = benzyl), containing both isomers of beta-TIC, were prepared. Both computational and NMR spectroscopy studies were performed. Areverse-turn conforma-tion was observed in the case of (R)-beta-TIC enantiomer thatwas obtained in 99 %enantiomeric excess by enzymatic res-olution. The beta-TIC/beta-Ala construct represents the first example of a flexible turn mimetic containing acyclic and an acyclic beta-aminoacid. 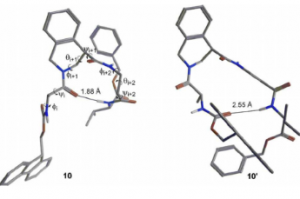 Furthermore,the presence of an aromatic ring of beta-TIC could facilitaten on-covalent interactions to increase the potential of this scaffold for the preparation of protein–protein interaction modulators.